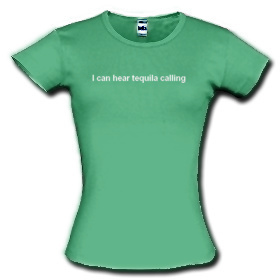 "I can hear tequila calling"
Yep, it is my new shirt I just bought. This site, Spreadshirt, lets you design your own, of course I wasn't so cleaver to state the obvious in this situation, but Jason from Kottke told me about EverythingAndNothing who did. I think I shall wear it for St. Patty day.